Instant appearance of naturally thicker & textured hair. Whether you have thin or thinning hair, you want to hide or cover certain areas, or just have an uneven hairline. Premium Natural cotton fibres suited to all skin and hair types; other Keratin fibre products on the market are wool based so don’t statically charge to your hair in the same way and often lose colour when worn, where as this Cotton Fibre provides a more volumised & natural look throughout wear without colour loss. This 22g size will last approximately 30days depending on the level of use each time the LDN Professional Hair Building Fibres are applied. Completely undetectable and don’t smear, irritate, change colour or stain. They also withstand wind, rain, & even perspiration. It will stay in place until washed out with shampoo. Used by Professional Hair Stylists Worldwide. 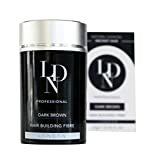 LDN Professional Hair Building Fibres instantly gives you the look of thicker & fuller hair. The Hair Building Fibres are made from a mixture of Natural High Grade Cotton and Rayon fibres. Due to this unique fibre composition, they have a strong natural static charge that creates a magnetic effect, tightly binding LDN Professional Hair Building Fibres to even the finest strands of human hair. Other brands of hair fibres claim to be made with similar properties to natural hair, and although this may seem like an ideal choice, the science behind it proves that as there would be no magnetic charge as both the keratin and your hair would have the same magnetic charge, their fibres would settle on your head giving a flat effect with no volume added from the fibres. LDN Professional Hair Building Fibres are made of a natural cotton fibre which has the opposite charge to your hair, making it join together and providing a volumising look.